Home > For sending suggestions for the betterment of Collegium System and/or to participate in the Joint Meeting of all the State Bar Councils, Bar Associations and other stake holders. 5. All the designated Senior Advocates of Supreme Court of India and all the High Courts. Sub. : 1. For sending suggestions for the betterment of Collegium System and/or to participate in the Joint Meeting of all the State Bar Councils, Bar Associations and other stake holders. 2. W. P. (C) No.13/2015 (Supreme Court Advocates-on-Record Association and Anr. Vs. Union of India). As you know, the special 5-Judges Bench of Hon’ble Supreme Court of India is hearing the matters and inviting suggestions for bettering the Collegium System in order to make the Collegium System independent and transparent. The matter was heard on 3rd and 5th November, 2015. Large numbers of suggestions have been received by the Apex Court. Today, the Hon’ble Apex Court was of the view that the public in general and all the stake holders should get an opportunity to make their suggestions and with that view of the matter, the Bar Council of India being the Apex Body of the Lawyers has also been entrusted with the task to convene a meeting of representatives from all the State Bar Councils, all the Bar Associations of High Courts, the Supreme Court Bar Association and other concerned. The suggestions received in the office of the Bar Council of India are to be submitted to the Hon’ble Apex Court latest by evening of 13th November, 2015. 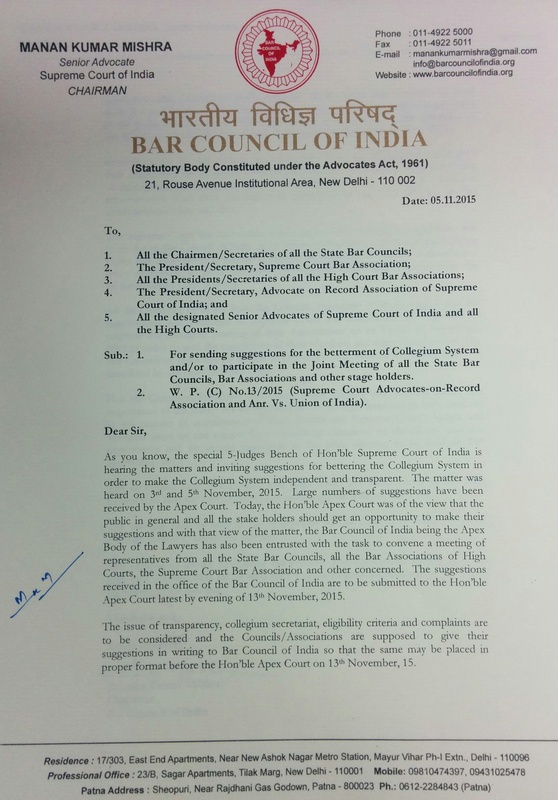 The issue of transparency, collegium secretariat, eligibility criteria and complaints are to be considered and the Councils/Associations are supposed to give their suggestions in writing to Bar Council of India so that the same may be placed in proper format before the Hon’ble Apex Court on 13thNovember, 15. 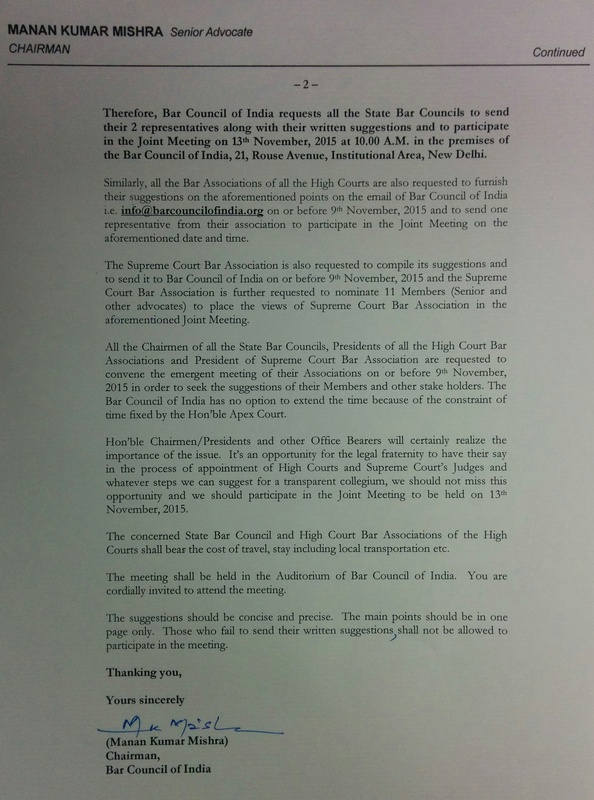 Therefore, Bar Council of India requests all the State Bar Councils to send their 2 representatives along with their written suggestions and to participate in the Joint Meeting on 13th November, 2015 at 10.00 A.M. in the premises of the Bar Council of India, 21, Rouse Avenue, Institutional Area, New Delhi. Similarly, all the Bar Associations of all the High Courts are also requested to furnish their suggestions on the aforementioned points on the email of Bar Council of India i.e. info@barcouncilofindia.orgon or before 9th November, 2015 and to send one representative from their association to participate in the Joint Meeting on the aforementioned date and time. The Supreme Court Bar Association is also requested to compile its suggestions and to send it to Bar Council of India on or before 9th November, 2015 and the Supreme Court Bar Association is further requested to nominate 11 Members (Senior and other advocates) to place the views of Supreme Court Bar Association in the aforementioned Joint Meeting. All the Chairmen of all the State Bar Councils, Presidents of all the High Court Bar Associations and President of Supreme Court Bar Association are requested to convene the emergent meeting of their Associations on or before 9th November, 2015 in order to seek the suggestions of their Members and other stake holders. The Bar Council of India has no option to extend the time because of the constraint of time fixed by the Hon’ble Apex Court. Hon’ble Chairmen/Presidents and other Office Bearers will certainly realize the importance of the issue. It’s an opportunity for the legal fraternity to have their say in the process of appointment of High Courts and Supreme Court’s Judges and whatever steps we can suggest for a transparent collegium, we should not miss this opportunity and we should participate in the Joint Meeting to be held on 13th November, 2015. The concerned State Bar Council and High Court Bar Associations of the High Courts shall bear the cost of travel, stay including local transportation etc. The meeting shall be held in the Auditorium of Bar Council of India. You are cordially invited to attend the meeting. The suggestions should be concise and precise. The main points should be in one page only. Those who fail to send their written suggestions shall not be allowed to participate in the meeting.